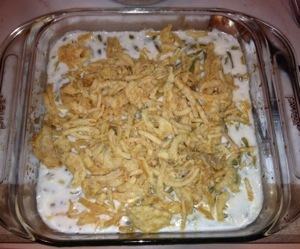 It’s just not Thanksgiving without green bean casserole right? I’ve eaten this since I was a child and love, LOVE, love it! 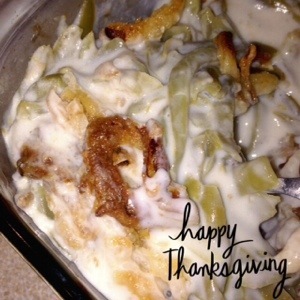 It’s one of those casseroles that is super easy to make and delicious too. 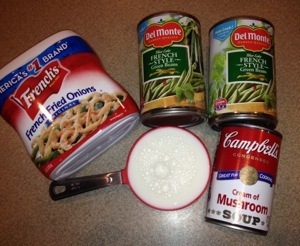 To save time, get this dish ready the day before. Store covered in your fridge until ready to bake. Add a few extra minutes of bake time because it will be cold when it goes into the oven. Enjoy! Heat oven to 350 degrees. 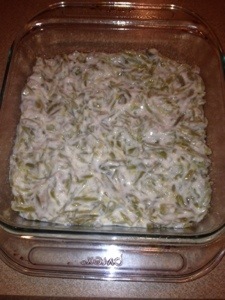 In 1 1/2 quart casserole or glass baking dish, mix green beans, soup and milk. Bake 20 – 25 minutes. 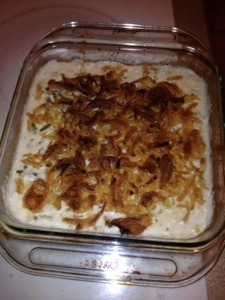 Top with onions during the last 5 minutes of baking( I always use more fried onions than it calls for because I just love them), until nice and bubbly.